"Application Technology Training" in conjunction with their 2016 AGM in Moncton. This is a great opportunity for growers to learn from one of the leading application technology professionals in the country. 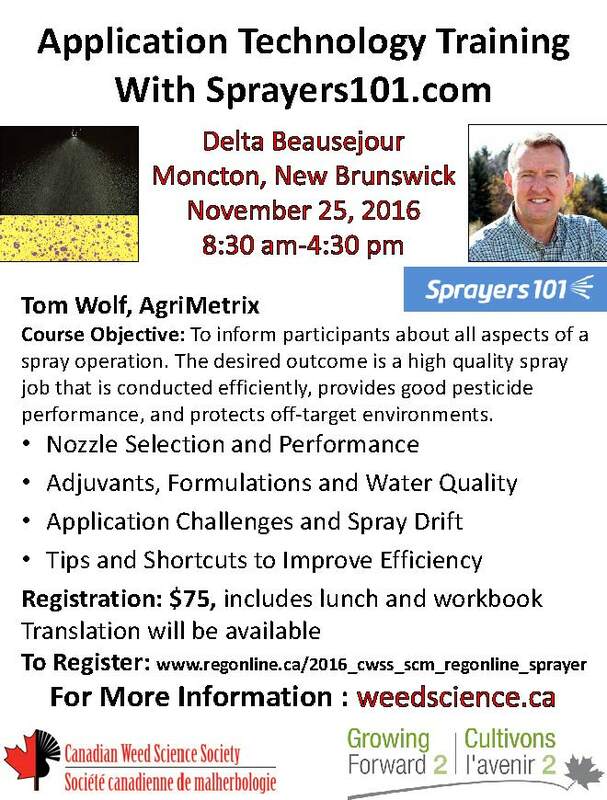 For pesticide applicators from Nova Scotia this session will be worth 6 pesticide applicator re-certification points. Seating is limited so register early, see the information below. A field (boom) sprayer calibration workshop will be presented in October at Canning (Oct 12), Debert (Oct 13) and Antigonish (Oct 14). Each event will be from 9:30 am to 3:30 pm. Participation is limited to the first 15 pre-registrants. Participants will receive 10 Nova Scotia PRCP points. This is a hands-on workshop. Participants will review a product label with particular attention given to product application rates and appropriate safety concerns. They will then calibrate a sprayer to meet the label requirements, learning how to do the appropriate calculations. After lunch (on your own) a different label will be used and a second sprayer will be calibrated. Bring a calculator, a notebook, and a pen/pencil. The workshop is sponsored by CropLife Canada. There will be no cost to participants (other than lunch). The instructor will be Jim Jotcham (Marbicon Inc.). To register for a workshop phone the Nova Scotia Federation of Agriculture at (902) 893-2293.